A parent struggles to make ends meet. A veteran deals with trauma while readjusting to civilian life. A young person tries to get out of a bad situation. Homelessness doesn’t always look the way we expect to see it. Arm In Arm has worked for over thirty years to help families keep a roof overhead in Mercer County through back rent, security deposit, and utilities assistance. But what about someone who has already fallen through the social safety net and has become homeless? Now, in partnership with the City of Trenton, Mercer County, and the Mercer Alliance to End Homelessness, we’re expanding our work in the community to connect more directly with people who are living without a roof overhead, many of them chronically. Along with other organizations, including HomeFront, NJ Transit Police, and Oaks Integrated Care, Arm In Arm meets homeless neighbors where they are and works with them to connect with community and housing resources. On a large scale, we are working to end homelessness in all of Mercer County. “We have homeless neighbors throughout the 11 municipalities in Mercer County,” points out Cynthia Mendez, Arm In Arm Housing Stability Director. Homeless people are a part of all our communities, and this first phase of outreach work will focus on reaching the homeless in Trenton. Left to right, Kevin, Cynthia, and Luis with Arm In Arm Executive Director Carolyn Biondi. 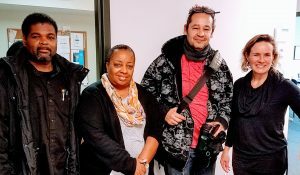 To do this work, Arm In Arm has received grant funding from the City of Trenton to hire two outreach workers, Luis Rivera and Kevin Parham, who work to locate, identify, and get to know people who are homeless. “Our battle is chronic homelessness, getting people off the streets,” says Kevin. Barriers like addiction and trauma, according to Luis, can prevent people from connecting and learning. But, as Luis demonstrates in his own life, barriers can be overcome. 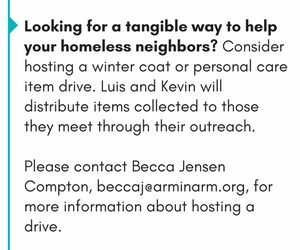 We are hopeful as Luis and Kevin use their experiences to build relationships and help homeless neighbors to connect with supportive programs and housing. But we also recognize the challenge before us. There are still gaps in service in Mercer County, like the lack of a family shelter or a shelter for single women, and funding is a continual struggle. Arm In Arm is proud to be one of several organizations in Mercer County facing these challenges to end homelessness. “I’m excited to see where we can go with this, and that there is support from our local government to do this work,” says Cynthia Mendez. The fight against homelessness will necessitate a concerted effort by the entire community, but it can be won.